Behind a solid performance from center fielder António Vargas, the Montana Pandas defeated the San Jose Hawks, 7-6. Vargas was 2-4 with a home run and 2 walks, while scoring 2 times and driving in 2 for the Pandas. Randy Rivera picked up the win in relief, improving his record to 3-8. Rod Day was tagged with the loss. Montana now sits in last place in the Continental League Western Division at 16-54. 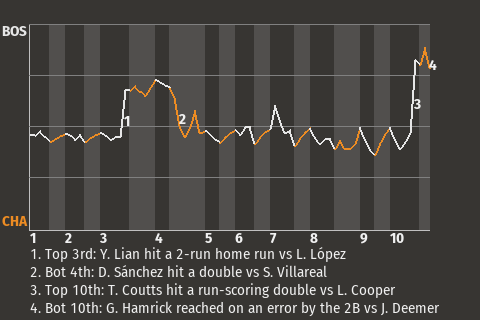 Vargas had a game-changing home run in the bottom of the 12th. On a 1-1 fastball from Rod Day, he banged a solo home run to left, giving the Pandas a 7-6 lead. It was the 3rd home run of the year for Vargas. "I like our resilience," said Vargas.